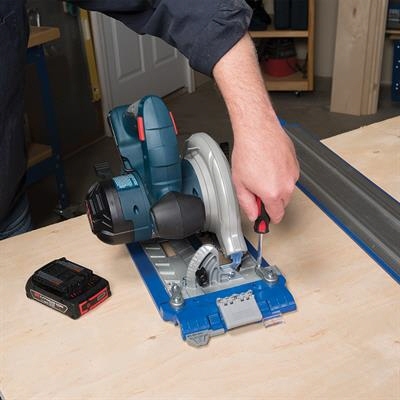 The Accu-Cut Saw Guide is aimed at the woodworker who wants to make clean accurate cuts in sheet goods but can't afford a dedicated plunge cutting track saw setup. Its main components are a two-piece aluminum track or rail and a plastic sled that can be attached to any standard circular saw. The sled, which mates with the track, guides the saw in a straight line as it slides along the rail. 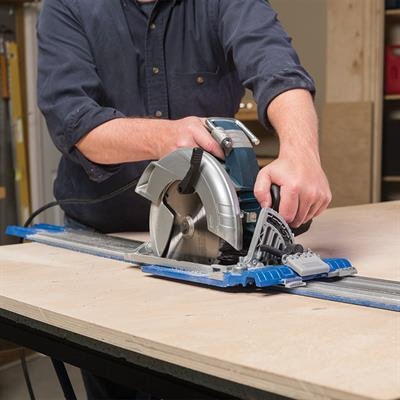 As with other track saw systems, splinter strips along either edge of the rail greatly reduce chipping by bearing down on the material being cut. 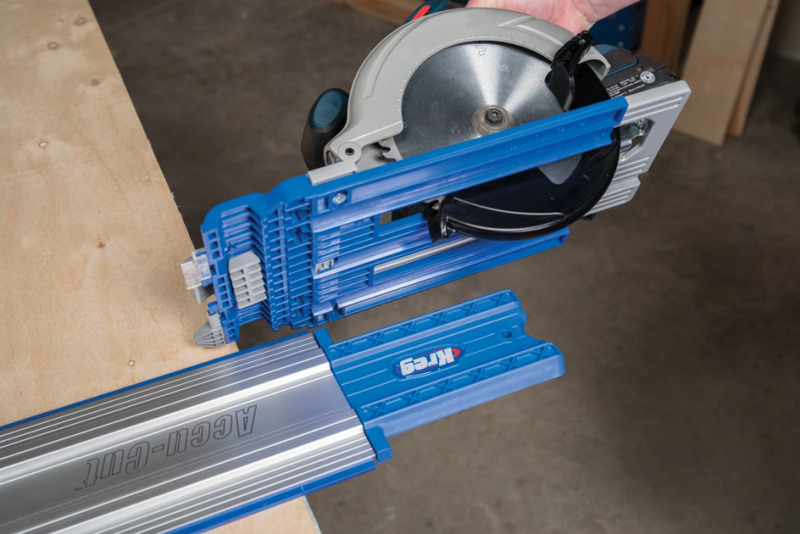 The first time you use it, the saw cuts through the splinter strip so from that point forward cuts can be quickly and easily aligned by placing the strip against the cut line marked on the material. The tracks are 26 1/2" long and can be joined end-to-end for cuts up to about 53" long, a perfect length for cross cutting 4x8 sheet goods but not enough for ripping them. I asked Kreg how they expected users to rip full sheets of material and was told they should use the company's Rip-Cut Edge Guide for that application. The edge guide will work but is a second-best solution to having a rail long enough to rip sheet goods with the Accu-Cut guide. 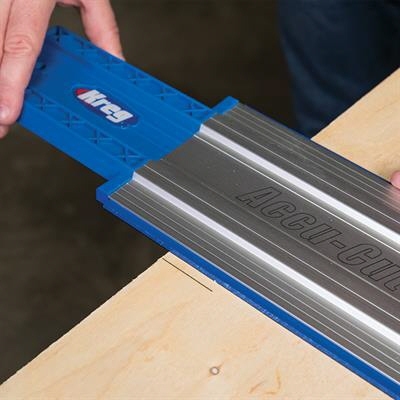 The Rip-Cut edge guide has no splinter strip and requires one edge of the cut piece to already be straight. 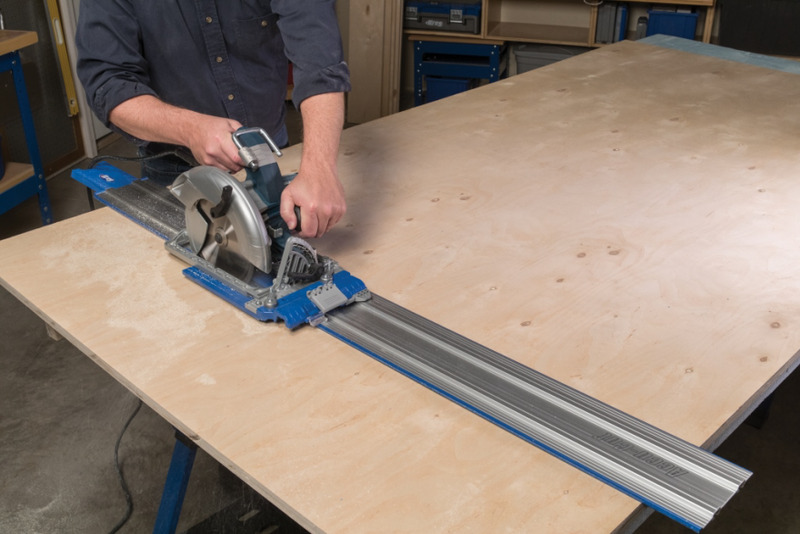 Another thing in favor of using a track is that the base of the saw doesn't touch the stock, so there is no possibility of scratching veneer plywood and pre-finished material. The Accu-Cut's rails are made from heavy aluminum extrusions and could easily be joined for cuts more than 53" long—if longer tracks were available or if the option existed to buy extra tracks and joining pieces. Neither option currently exists though the manufacturer claims to be considering it. Why would Kreg offer this accessory with such short rails when competitors such as DeWalt, Festool, and Makita offer them in much longer lengths? I asked and was told it had to do with packaging, shipping, and shelf space. It's costly to package long aluminum tracks so they won't be damaged in shipping, and beyond a certain length, it's no longer possible to ship them via UPS, Fedex, or the USPS. There's no technical reason why the tool could not be offered with longer rails; it's just that long rails take up valuable display space and make the product less attractive to retailers. The company would do well to offer additional rails and joining pieces. It might cut into sales of the Rip-Cut Edge Guide but would make for a far more usable track saw setup. Kreg sent me a sample, and except for the limited length of its rails, it works as well as any dedicated plunge-cutting track saw I have used—provided it's used with a good circular saw and high quality blade. Because it's designed for use with a standard (non-plunging) circular saw, the rail must be long enough for the saw to come into the material from the edge. 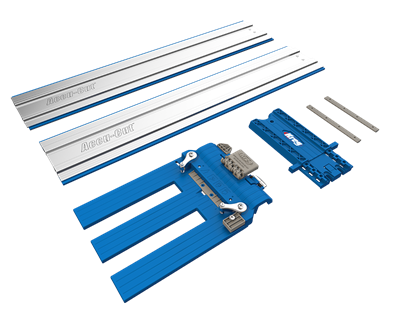 To that end, Kreg supplies a plastic end piece or "starting block" to support the saw beyond the end of the aluminum rail. 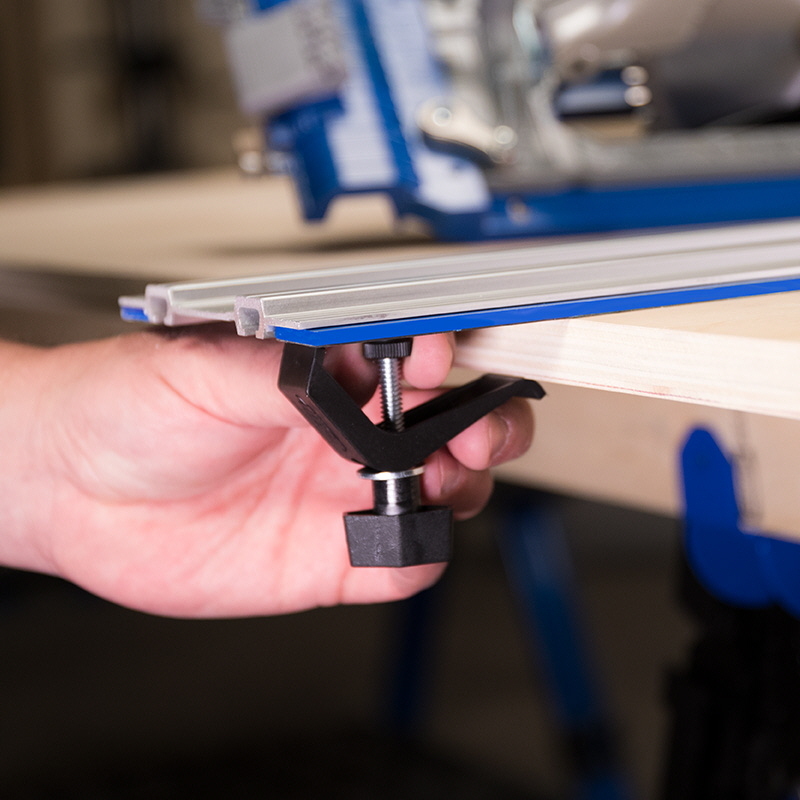 The splinter strip and starting block are designed to prevent the rail from sliding, but for critical cuts you may want to clamp the rail in place. For that you would want the optional track clamps, which are clunkier than the clamps used with other brands of track but also smaller and easier to store and transport. 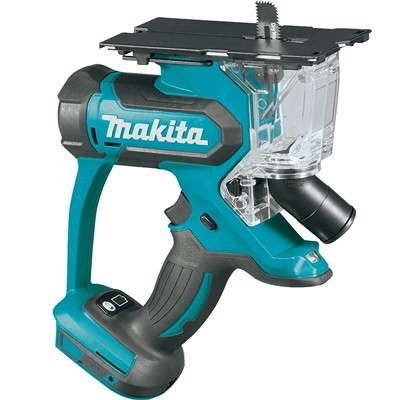 Nearly any corded or cordless circular saw can attached to the base with the supplied clamping screws. The screws can be shifted to alternate locations to accommodate different saw shoes. The shoe butts to an adjustable stop so the saw can be used on the base, removed for freehand cutting, and then quickly reinstalled with no need to realign the blade with the splinter strip. 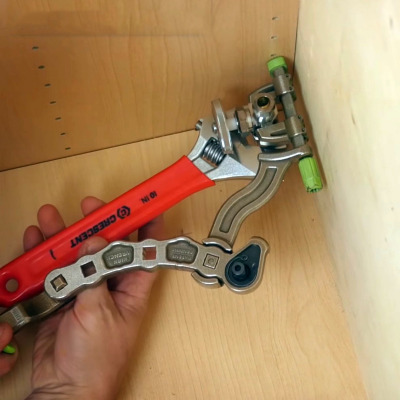 This is a handy feature for the person who owns a single saw and must use it with and without the Accu-Cut guide. If there's a weakness to this system it's the sled that rides on the rail. There is some slop between the pieces, though I haven't noticed it affecting the quality of cut. The bigger problem is that the sled is plastic and does not seem like it would survive more than one or two falls with a saw attached. A metal base would have been better though I can see how that might have greatly increased the cost of the tool—perhaps to the point where a $400-$650 dedicated track saw setup might not seem so expensive. 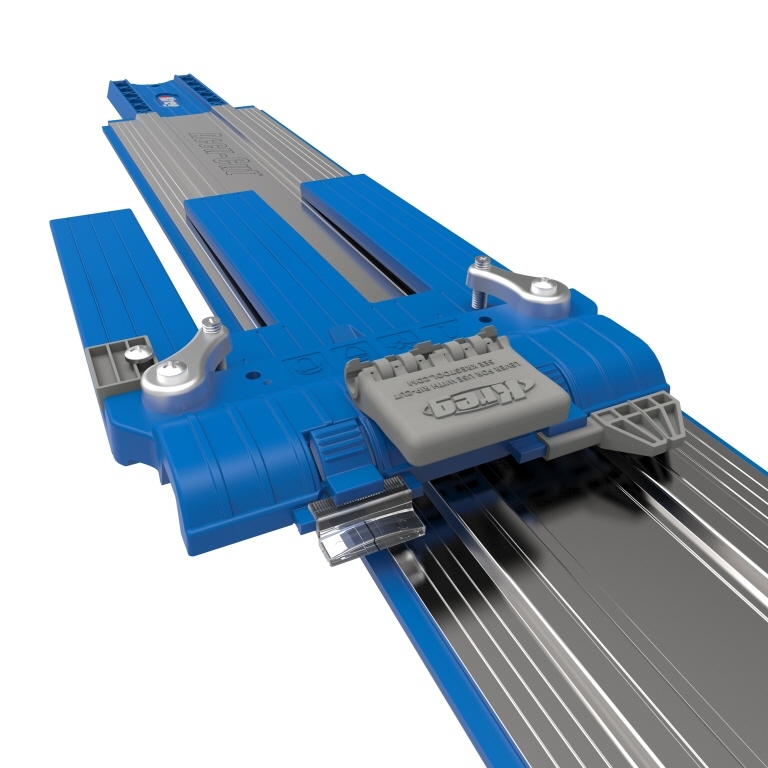 The Kreg Accu-Cut sells for about $80. 1. Saw blade run-out. This doesn't affect the straightness of the cut, but makes those ripply saw marks in your edge. A quality saw in good condition exhibits very little run-out. 2. Saw shoe not square. It's hard to get them truly square because blade is small diameter and doesn't give you much to place your square against. Making a cut, then turning one part over and placing the cut edges together will tell you how square you really are. Placing the saw on top of some sort of guide like this can exaggerate out-of-square errors. 3. Wobble. The saw itself must all be tight and stiff. Surprisingly few expensive saws even meet this requirement. It's the first thing I do when looking for a new saw. Wiggle the shoe and see how stiff it is. But another form of wobble comes from what the shoe is resting on. If it slides directly on the board, that's good. If it rests on top of some sort of guide, there is the possibility of wobble. 4. Yaw. This is "directional instability" in nautical jargon. If you are using an edge guide, it can grab and release and cause the saw to sort of jiggly-yaw around and gives a rough edge. 5. Poor measurements. Be more careful. My saws have a blade that is offset 5", exactly, from any fence that the saw is guiding from. I have two methods for guiding my cuts. I have an 8' shooter board made from 1/4" plywood with a 3/8" aluminum bar screwed onto it. Run the saw along the bar and it cuts the plywood to the exact offset of the saw blade. Now you can align that edge with your mark and you know exactly where the cut will be made. If the edge of the plywood gets messed up, or if you are about to start a new project, just move the aluminum bar over 1/4" and re-cut the board. I also have an assortment of 2" x 3/8" aluminum bars. What I did is go to the metal store and buy a 20' piece, then I had them cut it to 9', 5', 3', 2', 1' lengths. (You can cut it yourself if your store wants to charge you for it.) I filed the cut corners so nothing protruded and now I have straight edges for just about anything I want to do. And with overhangs to guide the saw at the beginning and end of the cuts. Use the large size Pony spring clamps to hold the fence in position while you are sawing and the results can be excellent. 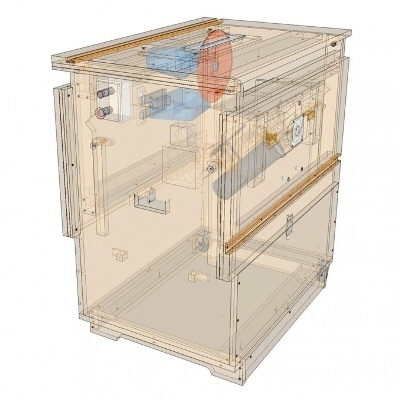 This tool is the antidote for manufacturers who ignore "design for disassembly"